With spring just around the corner I decided to turn one of my favorite cakes into a spring inspired dessert. Carrot cake reminds me of Easter, and yes Easter is still some time away, but keep this recipe handy for when it does roll around. Plus make a batch or two before, because you need a trial run right :)? These heavenly, cake inspired sandwich cookies are simply irresistible! They’re tender and soft with just the right amount of chew and crunch to them (chew being from the oats and crunch being from the nuts). The carrots offer plenty of moisture which also yields a rather cake-like cookie. You just won’t be able to get over how much they taste just like carrot cake. 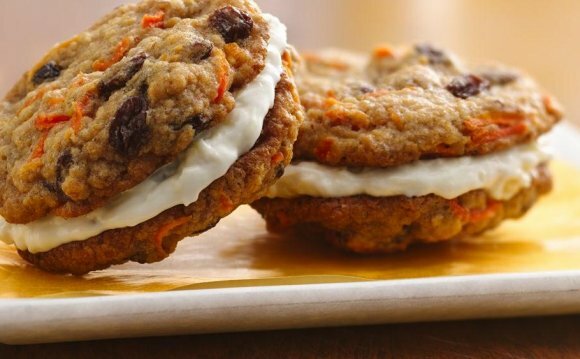 The cream cheese frosting sandwiched between these cookies is a must, these just couldn’t be considered carrot cake cookies without it. I love all the aromatic, sweet scents from the spices these cookies have. It always gets me so excited when I’m baking because I know what’s ahead. There are just so many great memories tied to the inviting scent of the traditional baking spices, like the holidays or slowly sipping a tall glass of warm spiced cider next to a flickering fire, as you longingly gaze out the frostbitten window pondering the gentle, peaceful fall of the delicate snow flakes and for a moment not having a single care in the world. Food brings me joy, can you tell :)? You might want to make a double batch of these cookies because depending on the crowd your serving, 12 just might not be enough. Everyone is going to want two (side note, if you do double it, divide the batter in half and chill the dough in two separate bowls covered with plastic wrap. Keep any dough that isn’t currently baking in the refrigerator). Enjoy! Drop dough 2 Tbsp at a time (32g each. You can roll them into balls for more even rounds - the dough is sticky but I rolled half of mine just to compare) onto Silpat or parchment paper lined baking sheets, spacing cookies at least 2-inches apart. Bake in preheated oven 12 - 13 minutes until centers no longer look doughy. Allow to cool on baking sheet several minutes then transfer to a wire rack to cool. Cool completely then sandwich 2 cookies together with the cream cheese filling. Store in an airtight container in a single layer.